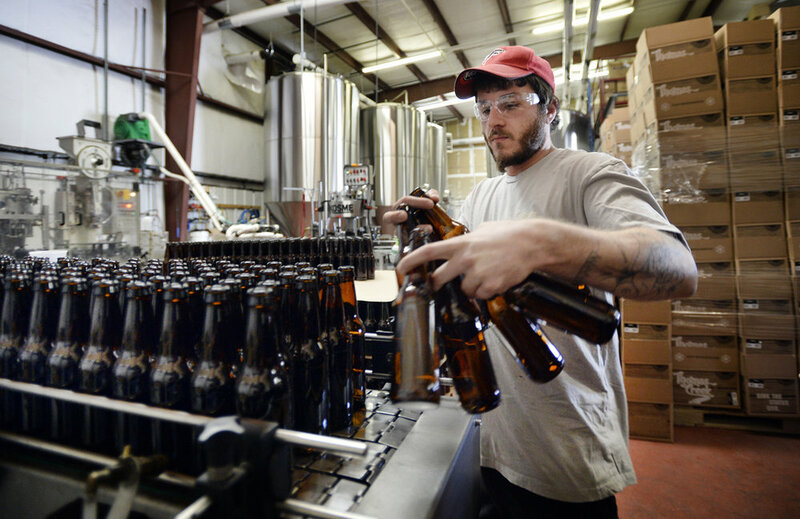 The craft brewery scene is growing exponentially in South Carolina. In the last three years, the South Carolina Brewery Guild reports sales have doubled for micro-breweries and Greenville is home to 50% of the state's craft brewery production. The economic impact has been significant. According to the SC Brewery Guild, local craft brew masters make a $254 million impact to the economy, attributing over 3,000 jobs. In 2013 a new state law passed allowing local breweries to serve loyal followers, on-site, up to 3 pints of beer per day, as opposed to the single pint allowed in previous legislation. This was followed by the “Stone Law,” allowing breweries to serve food, as well as sell bottles or cans of beer at their brew houses. The oldest and largest craft brewery in South Carolina is Thomas Creek Brewery. Father, Bill Davis and son, Tom Davis started their operation 18 years ago. Bill, a now retired architect says, “I have always loved a good beer.” Tom started home brewing in his garage, but has become a brew master creating his own recipes, forming a successful business in a booming niche. Thomas Creek is “quality over quantity,” Bill explains. Thomas Creek Brewery bottles 9 different types of craft beer, year round; including their signature River Falls Red Ale. It is a medium-bodied, light, smooth ale with just four types of hops. At the 2010, Great American Beer Festival, which celebrates and recognizes the best micro-breweries in the country, River Falls Red Ale was awarded the best Irish-Style Red Ale in the country. During the 2008 festival, Thomas Creek's Deep Water Dopplebock, a dark lager with a chocolate brown color was recognized as the best German-Style Strong Bock in the country, among 2,900 competitors. Meanwhile, Thomas Creek just released the Driftwood Series Bull Sluice Quad. Aged 6-8 months in bourbon barrels, it is a darker beer with an oak-liquor flavor. Containing 10% alcohol by volume, the Bull Sluice Quad is a strong beer named after a set of rapids on the Chattooga River, near the Georgia – South Carolina boarder. Although Thomas Creek is the oldest Upstate brewery, several others have national recognition. Swamp Rabbit Brewery's Raspberry Whitey won the gold medal at the 2014 U.S. Open Beer Championships in the “fruit beer” category. At the 2016 World Beer Cup, Greenville's own Quest Brewing won gold in the “field beer” category for their jalapeno-cucumber infused pale ale, Ponce. With the inception of Beercarolina.com, a website devoted to craft beer brew houses in South Carolina, along with The 2017 World Beer Festival in Columbia, South Carolina – the Palmetto state can be a beer lovers vacation destination.